Instant coffee can be found just about anywhere you go. It's super-convenient and is enjoyed—or at least tolerated—by those looking for a cheap, quick caffeine boost. While you may have had instant coffee or completely shunned it, do you really know what it is? Let's look at this quick coffee option that really does have a place in the world of java, even if it is only for convenience. Basically, instant coffee is just regularly brewed coffee with nearly all the water removed. It's not that mysterious of a process at all and there is no strange chemical alteration that goes on. Instant coffee is still pure coffee. Coffee powder. It does look like a powder, after all. Soluble coffee because it dissolves in water. Crystal coffee. The dried, powder-like substance is crystallized. Typically, instant coffee is made with Robusta coffee beans rather than the more expensive Arabica coffee beans. There are two methods for producing instant coffee crystals: freeze-drying and spray-drying. Vacuum evaporation: A process in which the coffee can boil at a lower temperature. It's also used to make ketchup, powdered milk, and other commercial foods. Freeze concentration: A more flavor-friendly process in which water-based ice is removed, leaving a more concentrated liquid behind. It's also used to make concentrated fruit juices, applejack, and concentrated vinegars. The freeze-drying method preserves the most 'coffee flavor,' but it's an involved procedure. It's likely that you will pay more for freeze-dried instant coffee, but the flavor difference is worth it. The coffee or a coffee concentrate (made by freeze concentration) is rapidly frozen to around -40 F (also, -40 Celsius). It's placed into a drying chamber, a vacuum is created in the chamber and then the chamber is heated. As the frozen coffee warms up, the frozen water rapidly expands into gas in a process called sublimation. What's left is dry grains of coffee. The spray-drying method of making instant coffee is almost as instantaneous as brewing the coffee. The transition from liquid coffee to instant coffee takes only 5 to 30 seconds. In this method, coffee or concentrated coffee is sprayed from a high tower in a large hot-air chamber. As the droplets fall, the remaining water evaporates. Dry crystals of coffee fall to the bottom of the chamber. Unfortunately, in this process, the high temperatures tend to affect the oils of the coffee and more of the flavor is lost. Also, it often produces too fine of a powder. To make the powder acceptable for consumers, the grains are fused together with additional processing that involves steam. Instant coffee was invented in 1890 by New Zealander David Strang. He marketed his instant coffee as "Strang's Coffee" and called his patented instant coffee process the "Dry Hot-Air" process. However, it wasn't until the Pan-American Exposition of 1901 that instant coffee received widespread attention. There, it was introduced to the masses by Satori Kato, a Japanese scientist who was working in Chicago. Later, in 1910, English chemist George Constant Louis Washington developed another process for making instant coffee while living in Guatemala. An avid coffee-drinker, he noticed a powdery buildup on the spout of his favorite silver coffee pot. That prompted his curiosity and further experimentation followed. He eventually produced a dried coffee crystal much like we still have today. His brand was called Red E Coffee. At the urging of the Brazilian government, Nestle began refining the instant coffee process in 1930. In 1938, the Switzerland-based company introduced its own instant coffee to the international market. They launched the product under the name "Nescafe", a portmanteau of "Nestle" and "cafe." In 1965, they expanded their instant coffee offerings to include Nescafe Gold, a freeze-dried instant coffee, in Europe. Instant coffee is often used on the go and in places where there is no proper kitchen (such as on trains, at drink kiosks, and in offices). With the advent of single-serve instant coffees (such as Starbucks VIA), drinking coffee on the go is easier than ever. Even if you don't care for a whole cup of instant brew, you can still use instant coffee to add a tasty touch to other drinks like hot cocoa. It can also be used in cooking and baking. Instant coffee is not just a drink. It's also a major ingredient in Caffenol-C, a homemade developing liquid for black-and-white photos. Interestingly, the cheaper the brand of instant coffee, the better it usually works for developing photos. Looking for instant coffee in your local supermarket? Popular brands include Nescafe, Starbucks VIA, Maxwell House, Folgers, Robert Timms, International Roast, Extra, and Kava (an acid-neutralized instant coffee). In general, an 8-ounce serving of instant coffee contains 27 to 173 mg of caffeine (most often 65 to 90 mg). A decaf instant coffee usually contains 2 to 12 mg of caffeine. Decaf instant coffee is made by decaffeinating the coffee beans prior to brewing and powdering them. Although instant coffee is basically just coffee with the water taken out and then added back in before it's drunk, there are some health differences between regular coffee and instant coffee. Whereas a normal cup of coffee has about 400 mg of polyphenols (a type of antioxidant) per 180 ml serving, instant coffee has about 320 mg per serving. Instant coffee generally has a slightly reduced caffeine level compared to freshly brewed coffee. If you're concerned about getting too much caffeine, this could be a benefit for you. 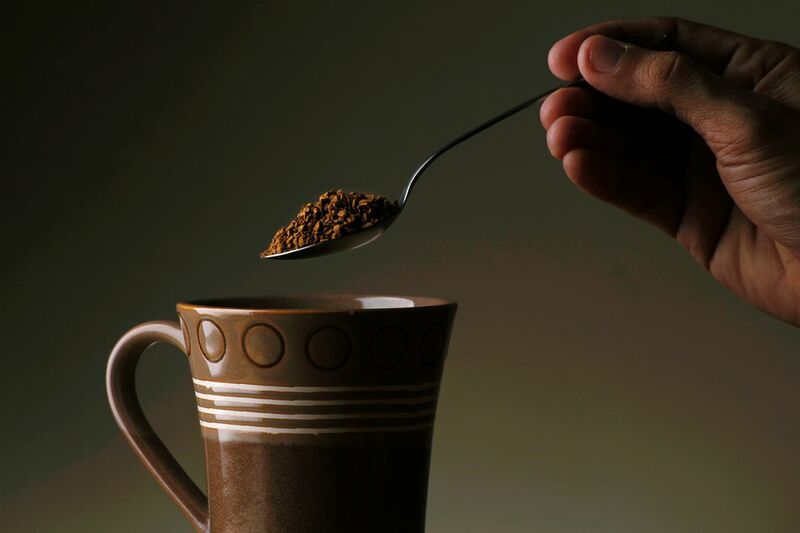 For unknown reasons, instant coffee may decrease iron absorption compared to regular coffee. Normally, the intestines absorb about 5.88% of the iron you ingest. With regular drip coffee, that percentage is reduced to 1.64%. With instant coffee, it's 0.97%. Tip: You can avoid any malabsorption of iron due to coffee consumption by drinking coffee one hour or more before eating. Also, don't drink coffee for several hours after eating. There is some indication that there may be an increased risk of bladder cancer for women who drink instant coffee compared to regular coffee. This possible increased risk does not appear to apply to men. Interestingly, brewed instant coffee is generally much lower in the carcinogen acrylamide than freshly brewed coffee (3 to 7 parts per billion compared to 6 to 13 ppb). Espresso powder—or instant espresso—is very similar to instant coffee, but it's stronger and is often made from a better quality coffee. It's usually made from darker roasted beans with a higher percentage of Arabica beans in the blend, resulting in a darker, smoother taste. It's usually dried with the freeze-drying method to preserve flavor. You can substitute instant coffee for instant espresso in recipes by using 50% more than the recipe calls for. Be warned, it may have a harsher taste than it would if you use espresso powder. Adding a little extra sugar can help counteract unwanted bitterness from instant coffee powder.